losing everyone’s beloved headphone jacks. To make up for it, some companies sell dongles that allow the use of regular headphones. Still, they intend for you to buy wireless versions instead of the standard ones. Whatever activity you prefer while listening to music, there is a suitable wireless headphone for you. Here’s how you can find out what those are. Wireless doesn’t have to mean it’s out of your budget. 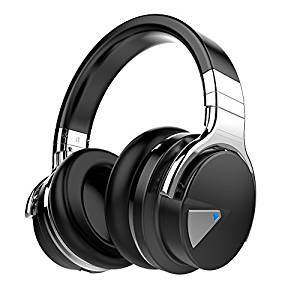 You can get a lot of wireless headphones, earbuds and similar products that are under $100, and in case your phone or MP3 player isn’t compatible with Bluetooth, they come with a Bluetooth transmitter or adapter. If you want to cough up hundreds of dollars, that’s fine. 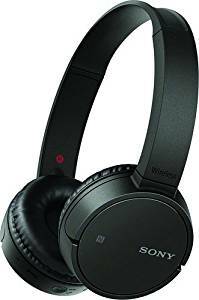 However, you don’t really need to because even budget-friendly wireless headphones can provide solid audio performance, durability and quality. Why should you buy a wireless headphone under $100? always better than cheaper counterparts. This is simply untrue and can result in spending more than what you need to. Buyers tend to think that expensive items are more durable and better for long-term use—retaining the quality of the product for extended periods. Some brands do possess this attribute, but to apply this logic to every item you buy can leave you very disappointed. Price alone won’t tell you everything about a product’s quality, especially wireless headphones. Be careful purchasing products with an overblown price just because of their logo or brand. Consider looking at the features and reading reliable reviews as well. This will help you locate the better products that are priced reasonably low and worth your money. You can choose from our list of the best wireless headphones, all for under $100. Aside from affordability, we considered performance, design, and quality as well. Perfectly compatible with your phone, music, TV and more. Say goodbye to your cords when using wireless headphones. Say hello to ultimate mobility. Can you remember how many times you’ve tried to untangle cords and cables but to no avail? It’s such a pain to be interrupted while listening to music, just because your cable caught on to something. Having wireless headphones gives you the comfort of being free from suddenly ripped earbuds and frustrating tangles. The energy requirement for Bluetooth power signals are very low so you can enjoy longer runs or workouts with your favorite playlist. Unlike losing the cables, the sound quality won’t be lost. This goes without saying that it still depends on the product you buy. Therefore, it’s also your responsibility to look for high-quality products. Wireless headphones can come equipped with bass-boosting technology and noise-isolation or noise cancelling, allowing you to feel the beat more, with the music you listen to. If you’re a busy person who needs to get a lot of chores done—especially around the house—then having to carry your phone wherever you go can become such a hassle. Wireless headphones can lessen that hassle for you. There are also headphones that allow you to answer a call during instances where your music listening session is interrupted. This feature can be activated with a single push of a button. Pressing it again, will end the call and resume your music. Driving is one activity when you want to have focus, otherwise, distractions can escalate into life and death scenarios. In most places, it’s illegal to drive while you’re holding your phone and talking on it. With a wireless headphone, you don’t have to do that. Both your hands are on the steering wheel, your eyes are on the road, and you can still talk. Wireless headphones will add something to your sense of style, given that you know which outfit to match them with. Many headphones have a sleek design that can mesh with different casual outfits. Sporty designs also exist for those who like to run and workout a lot. With manufacturers making everything Bluetooth compatible — computers, TVs phones, etc. — wireless headphones can work with a variety of these devices. For people living with several family members, Bluetooth TV makes it possible to watch your favorite show without bothering other people in your house. 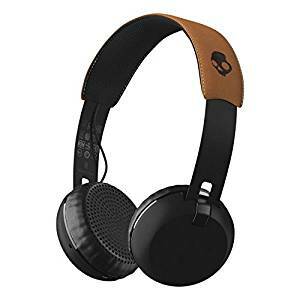 If your wireless headphone has access to multiple devices in your vicinity, you have the freedom to move around while listening to your favorite music or podcast. You don’t have to listen using your phone all the time. products with crisp, clear and enjoyable sound output close to those wired models. A defining benefit that wireless headphones allow you to do is walking across your room or around your house. However, it’s fair to keep in mind that range expectations should be realistic. Expect obstacles to interfere with the signal. Consider the stated distance state on the product. Eight hours or longer is the number of hours you want to look for when it comes to the battery life of a wireless headphone. It’s very important for calls to be clear and audible. If you’re going to use wireless headphones for receiving and making calls, make sure call clarity is a priority. You don’t want to have a product that is a pain to operate. You bought wireless headphones for convenience having a complicated product defeats that purpose. chance of overheating. It should also be light enough to avoid fatigue. It’s a horror to find yourself in a situation where your headphones break even if you just bought it a few weeks ago. Consistency is one recurring concern that a lot of buyers have. Make sure you check the warranty and if the store you buy it from has good customer service, this is to ensure a hassle-free return or exchange. If you’re the type of person who likes creating their own personal space for music, leisure, and relaxation then you must obtain a good pair of headphones. You have absolute control of where to take calls and listen to music. With your devices synced up the possibilities of what you can do with them is at the limit of your imagination. It’s important to look at details like specs and frequency response number, but don’t rely on too much of these. Like a lot of decisions in life, you need to have prior experience to make good judgments. So, take those products and listen to them carefully. Your lifestyle and day-to-day activities also give you an idea of what model you should purchase it. 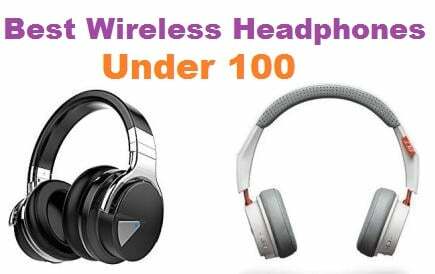 It won’t take you an eternity to find the best wireless headphone for you, a lot of devices have Bluetooth. With all the wireless headphones out there, there’s bound to be one that fits you. charm to your life with the marvelous Backbeat 500 Wireless Headphones. You can listen more if on eighteen hours of power on a single charge. The cushioned design which is light in weight gives utmost comfort and does not weigh you down. It has got a long battery which lasts for a long time. The battery which is rechargeable enables you to listen more and has got 18 hours of wireless listening time that is on a single charge. It has superb comfort. It has got light in weight memory foam headband and nice earcups which provide utmost comfort. Besides this, it gives sound isolation so that one can have fun in movies, music and calls. It is highly compatible with Bluetooth. The Plantronics Bluetooth headsets and headphones are totally compatible with the Bluetooth devices. In order to pair a headset of Plantronics with Android, Windows device, it has to support Bluetooth audio streaming. You can enjoy best quality audio with your Backbeat 500 Wireless Headphones. The 40 mm drivers and advanced acoustic technology can provide the correct audio balance and a powerful sound with highly comfortable headphones. Another fine aspect is the exceptional connectivity. You take calls with a wideband-enabled mic. This helps you get access to Google Now, Cortana or Siri from your headphones. You may link two devices and pair 8 devices. You may plug in an analog cable as the backup for listening without interruption. The battery runs for 18 hours on a solitary charge. There is a deep sleep mode which assists in battery life when you do not utilize your headphones. The quality of the audio is very high. The bass tube design and Plantronics signature audio give a deep sound which adds music to life. The controls which are on the ear can be used with ease. You can play or pause, adjust volume, skip tracks and make calls with ease. The design is light in weight and has a soft memory foam headband and earcups that lay flat and rotate. You may enjoy music for hours without getting tired. headphones. The E45BT is the finest product ever and has 16 hours of battery life. It is highly elegant and stylish headband. It has got an ergonomic on-ear design. This implies that your entertainment is for sure and your fun aspect gets enhanced irrespective of what you are doing or making your way around the town. You may switch from your music on your portable gadget to a ring from your phone. There are different colors and the convenience of a detached cable with microphone and remote. You will never be without these wonderful headphones. These headphones will make your day full of fun and color. 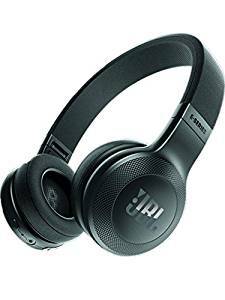 These stylish headphones have a unique JBL appearance and have rounded corners. They can fold up and swivel. The best aspect regarding them is the design. You can get the headphones in a wide range of varied colors. These colors are blue, black, red, green and white. There is a micro USB charging port which is present in the left ear cup. On the right one, there is a power switch, volume up or down buttons and a multi-use centre button. There is also the presence of an aux port. There is also a Bluetooth button. The battery life of these headphones is good. These headphones can last for sixteen hours and it is nice for this price range. 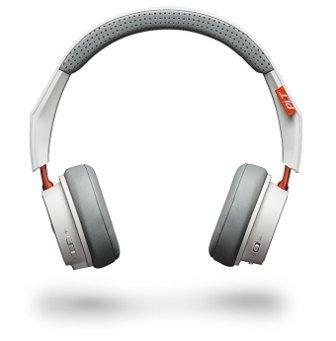 The headphones utilize Bluetooth 4.0 and you may get a standard range of ten meters or thirty-three feet. These headphones have a soundstage that is nice. The headphones do not get distorted with ease. These headphones have a good bass and this will impress the people a great deal. There are headphones present in the box and also a micro USB charging cable and an aux cable. powerful music. Motivational audio becomes more potent. It’s just you and your music or podcast no matter where you are. No more distractions from all the rackets and ruckus. 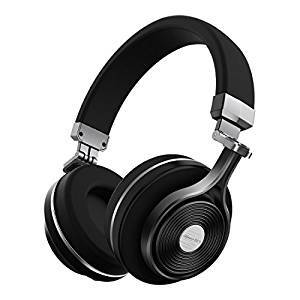 Equipped with professional active noise canceling technology, this headphone creates significant noise reduction even while you are traveling or working. Anything from the bustling city noise to a busy environment, this product can handle. If you haven’t tried the power of noise cancellation, you’ll be surprised at the difference when it comes to how much you can absorb from your music—compared to your regular listening sessions. For deep, precise bass response the Cowin E7 has 40 mm large-aperture drives. Crisp, powerful audio is ensured. Combined that with noise reduction features this device makes it suitable for people who want to listen peacefully. With this product comes its very own built-in high-quality microphone. Make your call hands free and enjoy the perks of Near-Field Communication technology. With NFC accompanied by voice prompts, you can expect your Bluetooth connection to be quick and stable. You can expect skin texture, lightweight, and comfortable fit with the protein earpad and the 90° swiveling earcups. It’s amazing how much ease and comfort they can provide to your ears. Good to wear throughout the day. One fully charged Cowin E7 can last you for about 30 hours. That’s 30 hours’ worth of uninterrupted listening. 30 hours noise free plus a built-in 600mAh battery that makes sure your headphones won’t power off incidentally. Everything you need to control this device is right on the earpiece. The volume control, and the play/pause/answer functions all in one place. For something that lasts 30 hours, it only takes 3 hours for it to fully charge. Also, it comes with a reasonable 18-month warranty. Their customer service is very professional and friendly as well. making a terrible mistake. Not all personal listening devices are created equal. When shopping for audio gear it’s important to take note of the quality, how comfortable it is and of course, its capabilities. Yet sometimes, these factors are hard to determine prior to purchase. 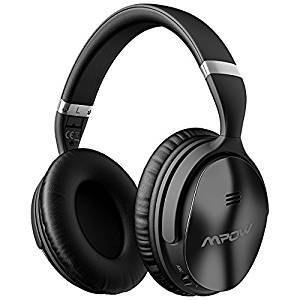 The Mpow H5 Active Noise Canceling Headphones is your go-to product if you’re looking for a robust, sturdy design. This item is certainly worth recommending. Advance Noise Canceling (ANC) technology allows effective cancellation of outdoor background noise and ambient noise. The only persisting sound that this device cannot cancel is a human voice, unfortunately. Comfort is never an issue because of the protein earpad, 90° swiveling earcups, and adjustable headband this product has. It’s lightweight and has a built-in 18 hours of play time. This allows you to enjoy your undisturbed listening sessions longer. Bluetooth 4.1 allows connectivity range of up to 33 feet. If you have the urge to suddenly go back to wired devices, there’s an option for you to use the 3.5mm wire included in the product. You can also use this for times when you run out of battery and still want to continue listening. The active noise cancellation is just a one button press, located on the right ear cup. Track control, power, and volume are all very easy to use on the ear cups. It’s very intuitive and you won’t spend a lot of seconds feeling for them with your hands. When it comes to calls, the CVC 6.0 noise-cancelling microphone has got you covered. Enjoy good quality wireless calls. 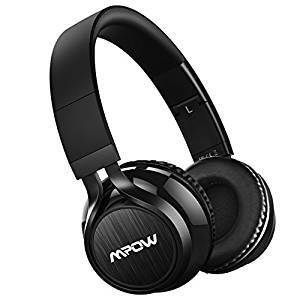 In summary, the Mpow H5 Headphones is impressive design-wise, and its features are excellent as well as the sound quality. This headphone is easily comparable to a pair of Bose or Sony headphones, except this one comes at a lesser expense. Mpow products come with a 45-day money back and 18-month warranty. present in the market that give you more than what you pay for it. 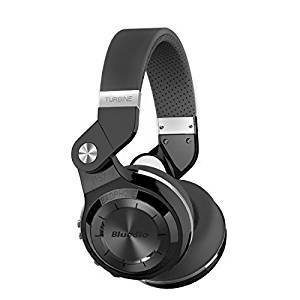 One example is the Bluedio T3 Extra Bass Wireless Bluetooth 4.1 Stereo Headphone. Not only does it have a refined look and multifunctionality, it’s also comfortable and lets you listento the best audio quality forlong periods. The way this product minimizes sound distortion is with its 57mm drivers with a specially designed titanizing diaphragm that improve transient response. This headphone delivers powerful extra bass and dynamic sound without sacrificing mids and highs. The 3D sound is made to make the user feel like they are in the middle of a concert. You can feel the music flow to your ear from every direction. This feature shines the most when it comes to watching movies and series. The difference is very noticeable. The analog noise resistant silicone lets you make and receive calls with ease. This item’s microphone sensitivity is at -42dB with a high Signal to Noise Ratio. No need to worry if people on the other end can hear you, because they sure will. The combination of beauty and strength is present in T3 with its alloy frame. You can take it with you for outdoor adventure and you will have no worries about dents and scratches because this product can resist those. Bluedio T3 is built from polymer and premium alloy. This is a signature long-lasting product. Foldable, collapsible, you can carry this item around anywhere you want. Just place in the provided carry bag. Long-pressing the volume up and down buttons on the side can turn it into a selection button as well, providing great convenience. The sleek design allows you to take control of everything without having to eye the control pad. This level of convenience is what the Bluedio T3 can deliver. high-resolution audio output?The resonant, clear and rich sound is what the BT-HF1 can produce with the help of CSR aptx® technology. The wide and dynamic range provided by this item allows you to immerse yourself more in every beat sound you hear. Never be inconvenienced with chords that always get tangled. Bluetooth 4.0 saves you the trouble when streaming audio. Comfort is not a problem with the BT-HF1, because with its lightweight materials—such as protein a leather headband and meta earpieces—your head will be cozy during long listening periods. Listen to your favorite song on repeat for 12 hours if you want to. That’s how long a single charge lasts. Noise-isolation ear cups are prominent features of the BT-H1F allowing a deep and engaging experience—free from distractions—transmitting lifelike music. You won’t notice the difference between wired headphones and this product. This is all possible with the addition of CSR aptX audio technology. This device is decked out with aluminum black and anodized space gray contrast together with protein headband, ear cups, and metal earpieces. The BT-HF1 will never let painful pressure points develop with prolonged use. It’s very light but durable at the same time—comfort level is high with this headphone. Streaming 12 hours of music with a single charge is always possible with the BT-HF1 wireless headphones. It’s not every time you get to have a product with good quality sound output both on wireless and wired mode. A comforting fit while still being luxuriously soft, this product is made of lightweight aluminum and plush leather ear cups. Some headphones don’t live up to the listening experience that artists intend when creating a song. The BT-HF1 is a product that actually lives up to that. Sound quality, size/portability, and comfort are all balanced. Any smartphone, computer and tablet brand can work with this. it also comes with a user-friendly control scheme. For an item of this price range, it has adequate audio reproduction—perfect for casual listeners. Unfortunately for more in-depth meditative listening, this product isn’t a fit for that. Its noise isolation is passive, and not everything can be cancelled completely given the absence of active noise cancellation (ANC). On the bright side, this means it won’t damage the audio and drain the battery. So if considering the absence of ANC you can expect better sound quality. Also, expect Hi-fi sounds with the CSR chip and 40 mm driver together. When you have something like the memory-protein ear cushion, it almost feels like human skin. A perfect fit without constraint is achievable because of the stainless steel slider and soft-paddedheadband. Durability is also never out of the equation. For this item, 20 hours is the playtime with a single charge. If you want the headphone to never power off, you can still use it in wired mode. Just attach the cable and you’re good to go. To save your more desk space, you can use the provided bag to store the Mpow 059 with its foldable capability. You can never get enough of the immersive hi-fidelity sound with this headset equipped with CSR chip and around-ear robust cushion design. You can easily connect this Bluetooth headset with smartphones, TVs, and tablets within 33 feet. The crystal clear sound takes effect at a fair distance. Take note that the driver software of the receiving adapter must be fully updated when connecting to a computer, also you need a separate Bluetooth adapter when connecting to a television. The built-in microphone is only working in wireless mode. The stability of the connection of the Mpow is reliable and quick with any Bluetooth enabled device. list of best-selling headphones and it’s likely you will see their name. That’s because Bluedio has expertise in producing high standard audio equipment steadily. 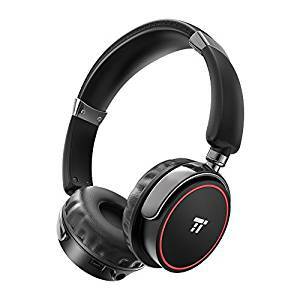 T2s are designed to be portable Bluetooth headphones to be used by active users. Its comfortable metallic look can get you a decent amount of attention. With a speaker diameter of up to 2.24 inches, you’re sure to experience clear highs accompanied but rich and strong bass. Bluedio likes to deliver the best music experience with their products. The 195-degree rotary ear cups can make way for some creative and easy ways to store this item and save more space. The latest Bluetooth 4.1 chip can transmit data and incredible speeds, giving you not only smooth bit reliably fast user experience. This device can also last impressively at 40 hours per charge because of its low power consumption. Sufficient foam and leather cover the headband and ear cups. It’s also amazing how the headband is adaptable enough to adjust a variety of head sizes. When the battery runs low, attach the cable that comes with this product to transform it into a wired version. Never let a low battery stop you from listening to your favorite music. One year warranty is guaranteed, from the date of purchase. This foldable and comfortable headphone is easy to carry. You don’t have to worry about breaking this strengthened T2S with a metallic look. Just like any headphone from Bluedio, comfort is always guaranteed. You’ll never go wrong in selecting to purchase the Bluedio T2S, for the price it’s at now. Long lasting battery and overall product longevity will help you retain your smile throughout the day. On days when you need cheering up, put your feel-good music on full blast while wearing these. Based on your personality type you can also choose from 4 different colors. candy Uproar Wireless headphones can offer. This Bluetooth enabled product features 10 hours of non-stop streaming. You can take this wherever you want. It’s easy on the ears with the way it’s designed. Having plush synthetic leather ear pillows, plus being lightweight creates an unnoticeable feel to it. You don’t have to worry about recharging for a while. A single charge can last for 10 hours. Enjoy carefree listening with your selected soundtracks. It only takes 2 and a half house to recharge this. Accessible buttons in the ear cups allow you to navigate playlists easily. With the built-in microphone, you can also take calls with ease. Change songs and adjust the volume with the plus and minus button. Hit the circle button to handle your incoming calls. Bluetooth audio can turn any area into your own personal comfort zone. It doesn’t matter whether you are outside taking a stroll or inside and slouching on your couch. Every music genre deserves precision audio, the Skullcandy has Supreme Sound technology that can deliver exactly that. During ill-advised listening levels, the sound quality does not easily distort, and that’s something that’s worth more than what you pay for. You will forget that you are wearing headphones when you come in contact with soft synthetic leader ear pillows. These days a lot of people consider weight and low profile design when choosing a headphone. The built-in mic and remote makes taking calls and changing track a breeze. Bluetooth connection with 10 hours of battery life is a decent spec. For a very fair price, you will get a serious bass response with these simple pair of on-ear Bluetooth headphones. Chasing the crisp highs and bass-forward sound? The Uproar Wireless got you covered. For this price range, it’s hard to find any other quality wireless on-ear headphones that can match. Plantronics BackBeat Fit 500 pair is very successful for sure. The performance of the audio is nice. It has a nice bass balance and also a high-frequency response. The design is resistant to moisture and is very secure and comfortable. The BackBeat Fit 500 has got a solid value. It is the finest option for a Bluetooth headphone which focuses on exercise. The battery has got a power of 18 hours on a single charge. The workout headphones consist of a memory foam headband and also earcups for ultimate comfort and sound isolation. This will help you enjoy movies, music and calls. It has got a nano coating which helps in the protection of the sports headphones against spills and moisture. It streams till 33 feet or 10 m from Bluetooth compatible tablets and smartphones. The appropriate audio balance and a rich sound are delivered through acoustic technology and the 40 mm drivers. This can be possible if you are watching movies, listening to music or making a call. It can access calls with complete ease and has got on-ear controls for music that let you play or pause, adjust volume, skip tracks and answer calls. These wireless headphones can get the right thing in case you want an on-ear headphone for your workouts. One can bring the music to life with the Backbeat FIT 500 Series wireless sports headphones in case you are winding down. It provides 18 hours of power on a single charge. It has got a sweat resistant technology called nano-coating. It is light in weight and has got a good design. The headphones have a 3.5 mm audio cable which is wired for passive listening. It also has a nice carrying pouch and a short micro USB charging cord. 12 hours of battery life. It has got a built-in microphone. It has the ability to track, call and control volume that is made into the ear cup. These headphones are just splendid. They are highly recommended at a price of less than $100. Grind Wireless enables you to take more phone calls. It has got an amazing 12 hours of battery life and awesome Bluetooth wireless streaming. You may utilize premium materials such as solid metal headband and also the plush on ear pillows. Grind Wireless has been designed for complete comfort throughout the day. Grind Wireless has got exquisite built-in controls which are very simple. One can play and pause music and also easily answer and end calls while skipping tracks. One can also adjust the volume with ease making use of the three buttons. These are the volume up button, volume down button and the main function button. It can be utilized to power on and off the headset. It can be also used to sync a new device onto it. The 40 mm audio drivers with Skullcandy’s Supreme Sound can make all kinds of music sound appear nice. In case the 12-hour battery requires charging, you may plug it in the AUX cord with the microphone. In this way, there are no chances you can miss a beat. The volume button can move to the next or previous track when it is pushed down for at least three seconds. The main function button can control Bluetooth and answer the incoming calls. An interesting aspect about Grind Wireless is that it has a built-in microphone and a 3.5 mm audio jack. The Skullcandy Grind Wireless is a solid pair of Bluetooth on-ears. Many audio firms have laid emphasis on big over ears. The on-ears get sidelined. headsets, the TaoTronics Bluetooth headphones, can make your talking or listening experience on the phone hands-free. It doesn’t matter if you are a busy professional, an athlete, or anyone looking for a convenient lifestyle. This device is a great choice for anyone. The balanced and improved sound is guaranteed with the help of the dual 40 mm drivers. AptX audio provides lossless sound and reduced latency when using Bluetooth, which is a great complement to the drivers. With only a single charge that takes 2 hours, you can enjoy playback all day for about 25 hours straight. If you want to see how much battery life is left, iOS users may look at the on-screen indicators to see the remaining battery. Make sure to charge this item one every six months at least. Also, we encourage you to use DC 5V charger to get the most out of your charging experience. Swiveling 90-degree ear pads that are super soft makes it possible for users to enjoy maximum comfort. Comfort is always a priority with these products. There’s no head that’s too small or too big for this headset. The adjustable and flexible headband fit’s everyone without straining them. On-ear controls make your listening experience hassle-free. Adjusting everything from volume, track changing, paying and pausing—everything can be done without using your phone. Answer calls and talks all you want with the built-in microphone. If you happen to prefer both wireless and wired listening, this headphone can support those options. Use the 3.5mm aux cable or listen wireless, it’s really up to you. You can reap the benefits of hands-free user experience or you can also attach the wire to save you from moments when your battery is running low. Bluetooth headphones. Mpow’s customer service is top quality compared to other companies and this makes them stand out. 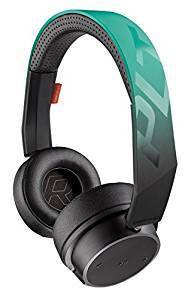 The sound and features are a bit subpar compared to some high-end headphones, but this is reasonably good for a headphone in this price range. Fast transmission speedis secured—plus lower latency—with its dual 40mm aperture driver units; creating better audio output. Check if the ear cushions seal your ears comfortably and experiment with different music genres while testing sound and volume. When you put this headphone on, expect the supple ear pads with protein leather to simulate the texture of human skin. Weighing at only 6.56oz decreases pressure for your ears. A retractable headband allows you wear this item in the most comfortable way you can. Speed and stability with your Bluetooth enabled device are ensured. You can stream music for up to 8 hours straight with this product with 2-3 hours of charge time. There is also an audio port that you can use by connecting to your phone and avoid running out of battery. There’s no need to get anxious when you are away from your phone because you can answer call up to 33 feet. The buttons on the headphones allow you to quickly answer without having to run all the way to your phone. Connect easily with your smartphone, tablet or TV from a reasonable distance with Bluetooth. The Mpow Bluetooth headset contains CSR chip, allowing you to optimize every listening session. The around-ear cushion can provide sturdy yet comfortable support, while you immerse in Hi-fidelity audio. Preparing for your travel is also easy because all you have to do to store this headphone is fold it down and store it in the provided headset bag. time to time there are products that break this rule. There exist products that will blow you away without having the pay hefty price. The EtekcityRoverbeats F1 is one such product. 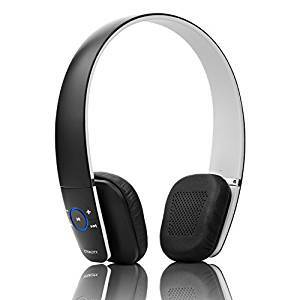 This is a pair of very affordable, excellent sounding over-ear Bluetooth wireless headphones. Built with 4.0 + EDR Bluetooth, The Roverbeats offer compatibility and convenience with all Bluetooth capable devices. Use it for tablets, Android smartphones and more. With the F1, pairing devices is an act of maximum convenience. Hands-free phone call and seamless listening all integrated into one device. You won’t ever have to pick up the phone just to navigate through your music collection with full function control button. The design is functional, made lightweight and easy carry. 10 hours of playback for such a short recharge time. The F1 has a feature that allows it to send battery status signal to alert iOS devices connected to it. With this feature, you won’t be surprised by the sudden death of your battery life anymore. You will know exactly when it’s time to recharge. Aside from being light, the EtekcityRoverbeats F1 have small ears cushions that rotate. You can adjust them for maximum comfort and accurate positioning according to your liking. You can also extend the ear cushions using the aluminum bands. Adjust it however you like. The pairing process is easy, just hold down the circular multifunction button for about 5 seconds. The LED indicator will flash red and blue, this means it’s in pairing mode. It also makes a beeping sound, alerting you even it on pairing mode even when you are wearing it. Three hours to charge for 10 hours of usable play time is a good ratio. Also, the 400 hours of standby time makes it easy to set it aside—without charging it again—until the next time you pick it up. Headphone. This item favored by many is now cord-free. It has a minimalistic design, and for a device with AAC, SBC, support it’s reasonably priced. It has a convenient one-touch pairing with NFC together with a built-in Mic perfect for hands-free calling. It’s easy to stream your favorite music with Bluetooth. Your smartphone, tablet and any device that is Bluetooth enabled can be paired. Enjoy the ease of control because all track playing and volume adjustment are accessible in this device. Forget all those complex set-ups, with Near Field Communication (NFC) technology. Touch a selected NFC-enabled device on the on-body N-mark for a quick connect. That way you can start streaming content over Bluetooth. But if you don’t have NFC, that’s still fine. You can manually connect to Bluetooth using the setting menu on your device. The 1.18-inch dome driver allows you to hear more details on your favorite track. Enjoy dynamic sounds from light and compact units. A user-friendly operation is guaranteed with all the buttons located in the right ear cup. With the right positioning, the response time is satisfactory. Listen to your music for long periods of up to 8 hours of battery life—depending on your settings—with the built-in Li-ion battery. You can use a micro USB to charge this headphone. Imagine taking phone calls even if your phone is inside your bag, that’s a real possibility with the high-end inline microphone. Issuing voice commands is also possible for those who have devices that enable that feature. The folding swivel design makes it a breeze to put away when you are not using the Headphones. Take it anywhere you go with features that allow you to slip it easily in suitcases, bags or anything practical.